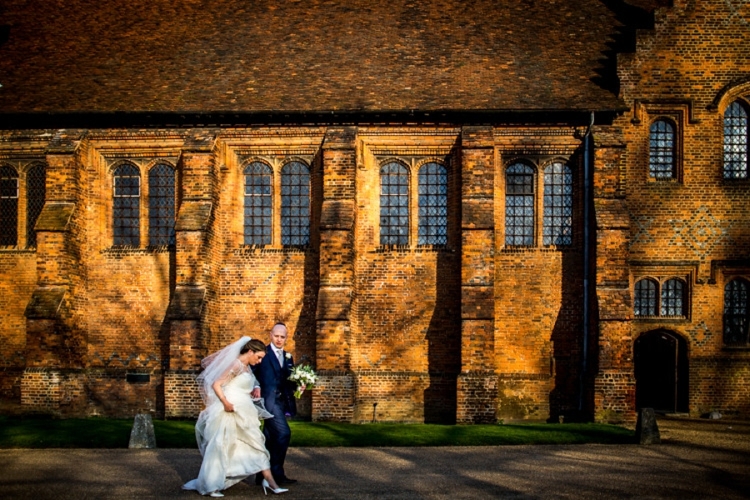 Meet Amy and Anthony who married in the evocative and enchanting Hatfield House, Hertfordshire, where none other than Queen Elizabeth I — England’s most elusive bride – tudored away much of her childhood. 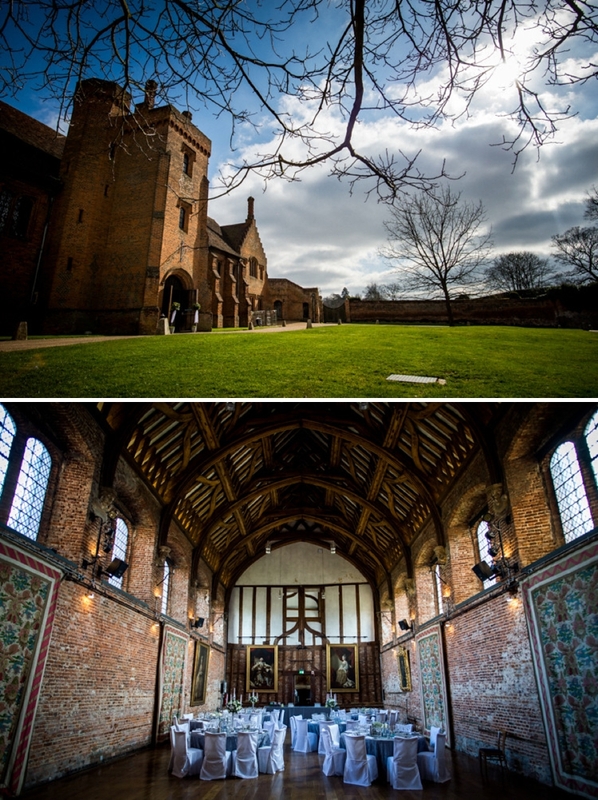 I’ve visited this gem north of London and the sense of history is absolutely spell-binding. 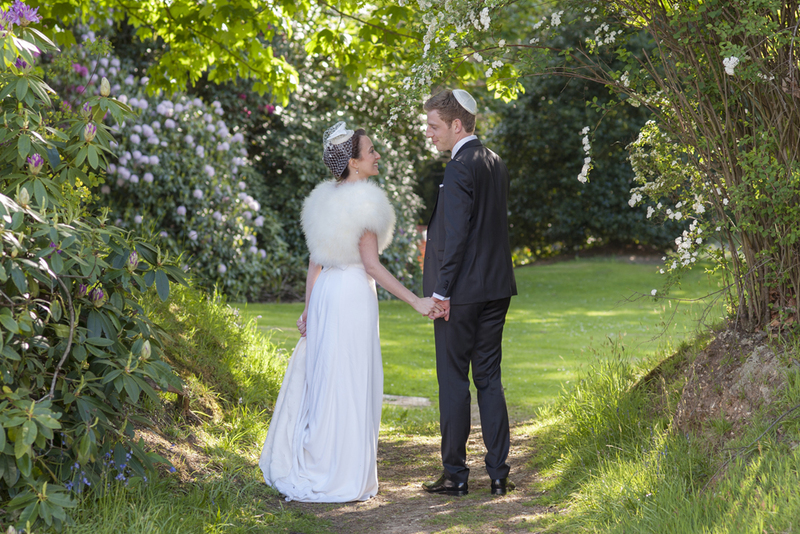 Amy chose a vintage vibe — not so vintage that she wore an Elizabethan ruffle – but as far back as the 1920’s where her sweeping gown and ridiculously beautiful beaded caplet stole the show. Pure and utter glamour. 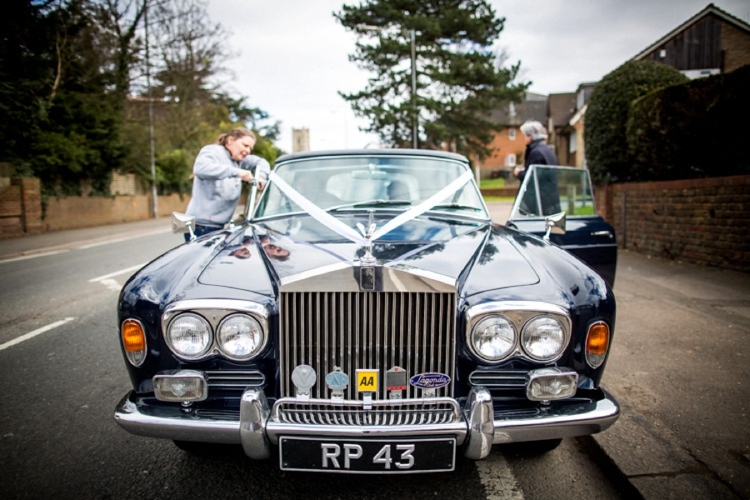 I love this wedding because whilst it has clear direction — Amy knew what colour scheme and look she wanted from the outset – it’s also nostalgic and sentimental, all in the right measure. 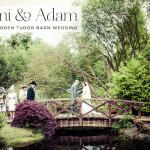 Amy and Anthony chose a Route 66 theme throughout their day, an ode to the famous highway where the couple got engaged. How romantic is that? 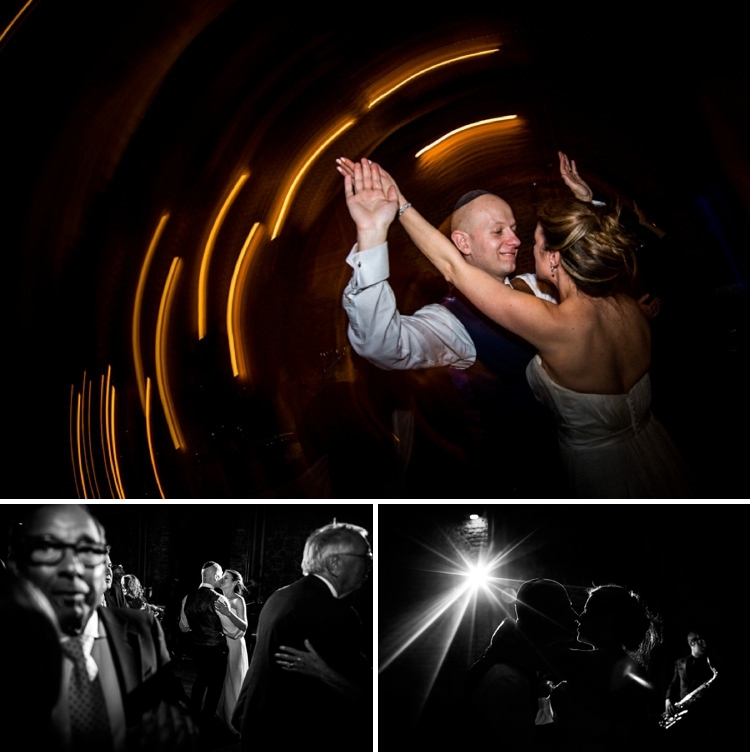 And quite appropriately, their first dance was Chuck Berry’s Get your kicks on Route 66. …And those sentimental touches — Amy wore her two beloved grandmothers’ jewels — a gorgeous gesture. Amy and Anthony didn’t use a wedding planner— they organised what they could (please lay your peepers on those sensational bridesmaids multi-wrap, one size fits all dresses by Two Birds) took advice when they should (the inspired churros and shots), and delegated with instruction elsewhere. Take the flower arrangement, let’s face it flowers are super important but you don’t want to be a Bridezilla obsessing about exactly which colour flower spray goes where, it’s more about choosing the right florist who “gets you”. Give them clear direction and then leave it in their capable green-fingered hands. That’s exactly what Amy did and her seasonal freshly-picked-that-morning flowers were a sensation. 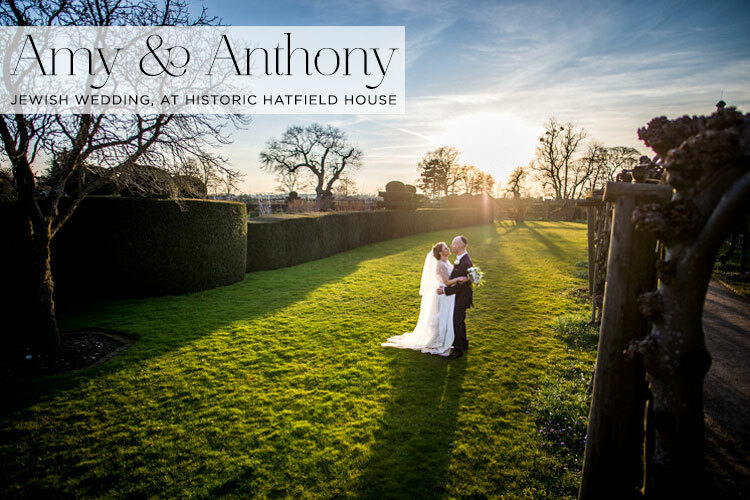 Anyway enough of me waxing lyrical about Amy and Anthony’s day — award-winning photo journalist Paul Rogers will give you thousands of words in a few stunning pictures. 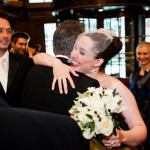 Amy, the Bride: We met on JDate… it does work! We actually grew up on the roads backing onto each other and our families knew each other but we had never actually met. I really wanted a vintage theme. The colour scheme was silver with grey, white and green and I was quite specific on where and how I wanted the colours to feature. We got engaged in the Grand Canyon during a road trip on Route 66 and so wanted to feature Route 66 touches in the wedding to make it personal to us. Although Anthony did try and convince me to make the aisle carpet for the ceremony look like a road and have ‘diner’ food for our wedding breakfast, I wanted the touches to be subtle and still tie in with our vintage theme. We chose the song Get your kicks on Route 66 for our first dance, and for the table plan, we had a picture that we took of a Route 66 road sign edited to look like an old black and white photograph. 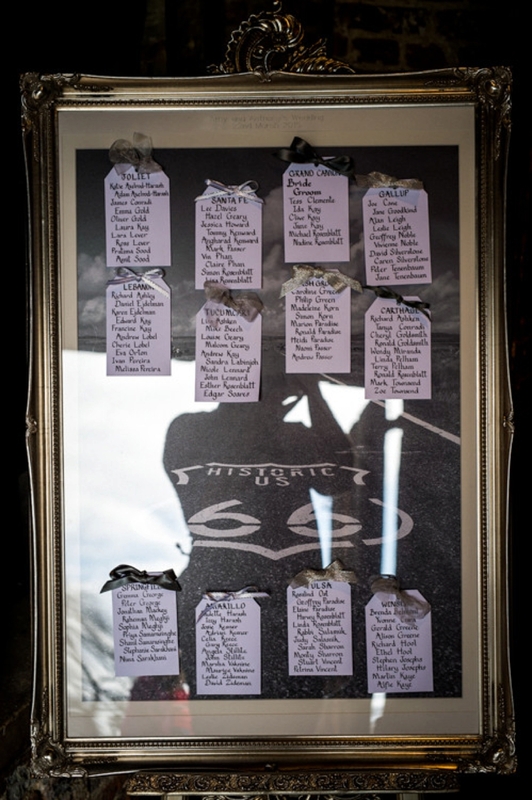 For the tables themselves, we decided to have names, not numbers and call each table a place on Route 66. We found some lovely old black and white photos of each place that worked really well on the tables. Choosing my dress was one of the things I was most looking forward to. I had booked appointments with five different shops and had glamorous thoughts about sifting through all these beautiful dresses with my mother and a glass of champagne over the course of a few hours. In reality, I found the dress after one hour in the second shop we visited and that was that! 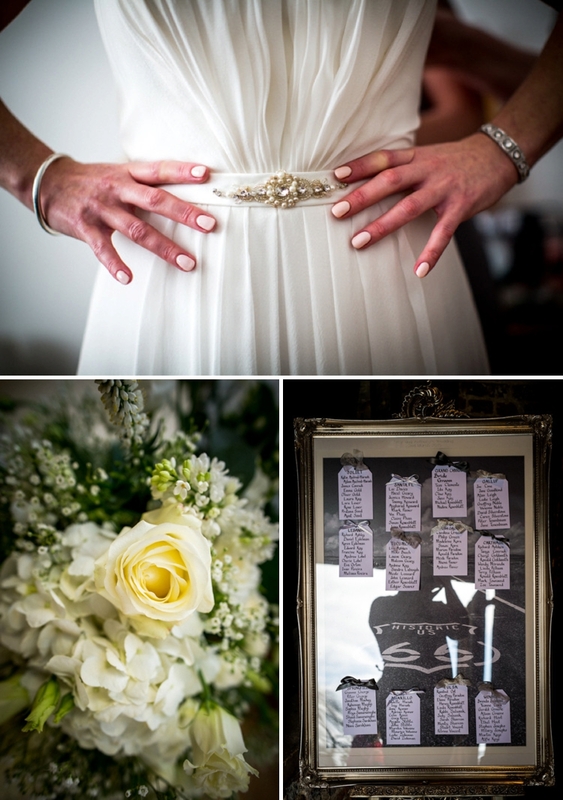 It was a Justin Alexander gown from a shop called The Wedding Gallery in St Albans. I almost didn’t try it on at all as I had thought it was too simple but the boutique assistant changed my mind. As soon as I tried the dress on and looked in the mirror I shed a tear, looked at my mother who rushed off to buy it and then we both went for lunch. I didn’t visit another wedding dress shop, or try any more wedding dresses on afterwards. My dress came with a very heavily beaded caplet (quite 1920’s) so I had to consider jewellery quite carefully. I didn’t want any bling in my hair but, as both my grandmothers are sadly no longer with us, I wanted to wear some of their jewellery so they would be there with us at the wedding in spirit. I wore diamond drop earrings and a 1920’s art deco diamond bracelet that matched my dress perfectly! For my veil, I wore a full length, very fine veil covered with little crystals that glimmered as you moved. I wore ivory 4 inch stilettos for the ceremony and changed into white wedge (4 inch high) trainers covered in diamantes for the party. 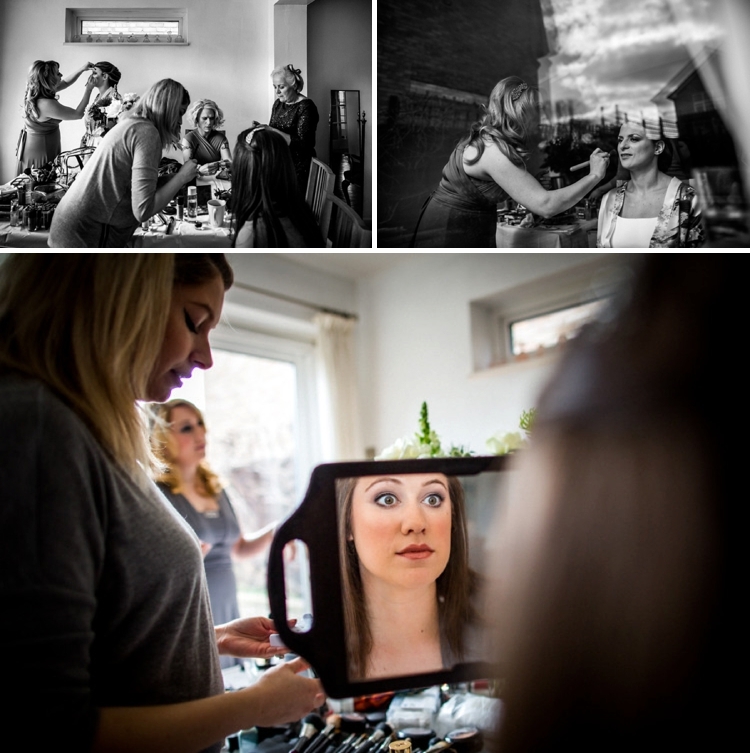 I had three bridesmaids: my sister, my sister-in-law and my first cousin. I chose the Two Birds multi wrap dresses in platinum which tied in with our colour scheme. The beauty of the dresses were that they were one size and you could change the way they fit to suit your individual shape (my maid of honour was due with her first child three weeks before the wedding). I also bought them matching Jenny Packham hairbands that were quite 1920’s and matched my dress. My groom looked so handsome! The picture of him walking into the badeken and seeing him for the first time always makes my tummy flip. He wore head to toe Ted Baker tailored to fit at Selfridges. It was a beautiful three piece suit in purple/navy. He also went to a barber for the first time in over 10 years just to make sure he looked his best for his big day! 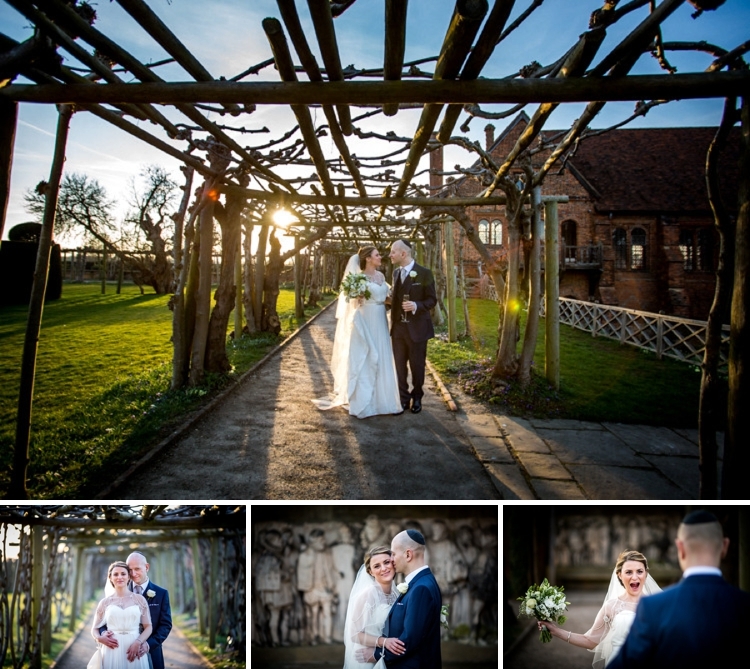 We chose Sunrise, Sunset for the procession and chuppah, (Fiddler on the Roof is one of my all-time favourite films). 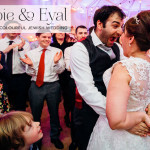 We had an accordion and violin playing klezmer music during the guests arrival and throughout the reception. The fabulous Jenny and Julia from Two Girls and Some Flowers designed and created all the flowers. I had quite specific ideas around the style of flowers I wanted — and the colour scheme — but needed some direction. In the end, we chose country vintage style flowers, and I was more than happy for Jenny and Julia to choose seasonal flowers on the day so nothing was too prescriptive. 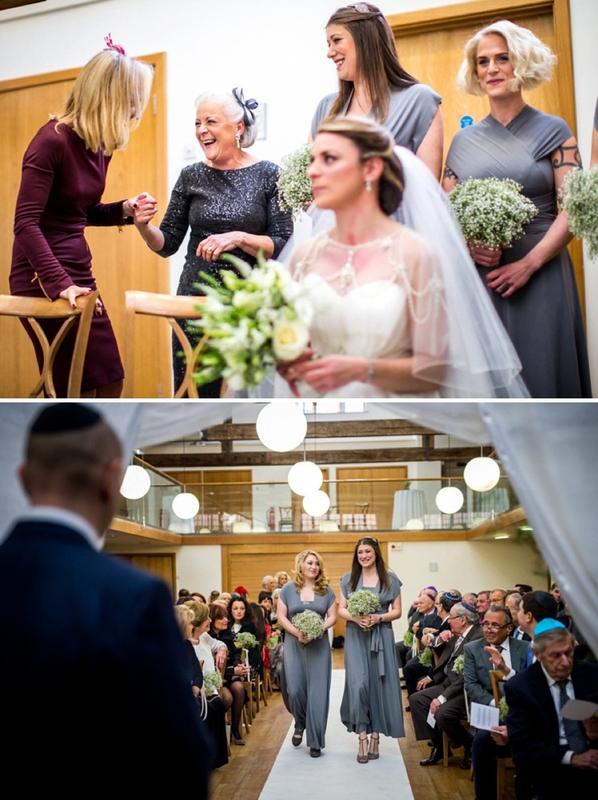 I also wanted the colour scheme of silver and green to be running throughout so Jenny and Julia added lots of foliage and silver touches like eucalyptus. 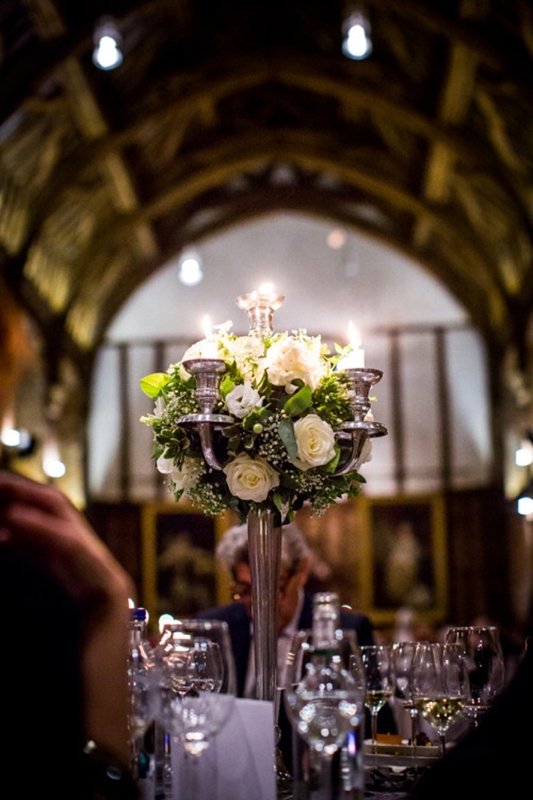 The table centres were a mixture of tall silver candelabras and a spherical ball of flowers with lit candles which was in keeping with the medieval style of the room at Hatfield House. We also went with a mixture of small pots and vases with individual stems for the lower flower arrangements. I only had to meet with them once to talk through my ideas and they got ‘me’ immediately which was great! My bridesmaids had gypsophila as their bouquets and we had small posies of gypsophila tied to each chair down the aisle. 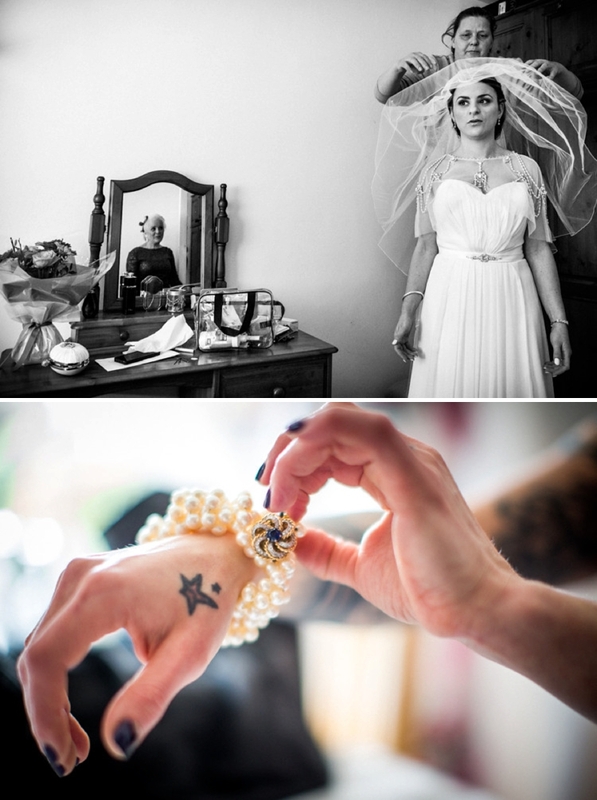 Jenny and Julia also created the most amazing bouquets for both the mothers as a thank you, as well as the groom sending me the most amazing bunch of beautiful white roses. Button holes were classic white roses. I really wanted the essence of the day to be captured, and my husband was adamant that we wouldn’t spend the whole day posing, so when we stumbled across ‘reportage’ style of photography, we hit the jackpot. 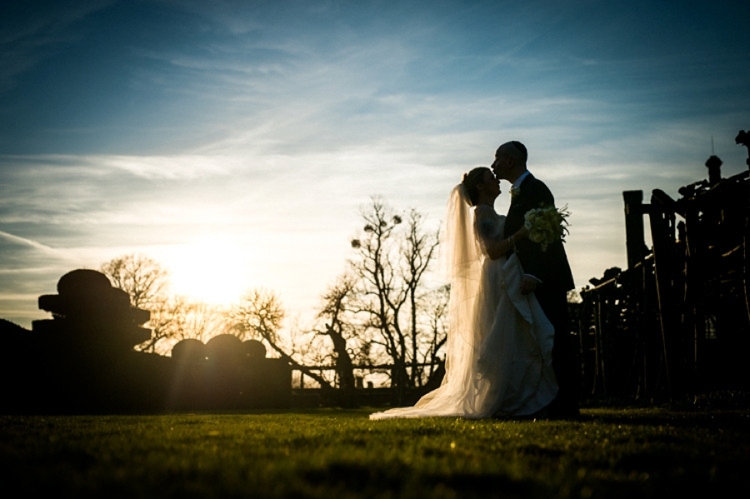 We found Paul Rogers on a photo journalist website and as Paul had won lots of prestigious awards for both his wedding photography and photo journalism we decided to contact him. 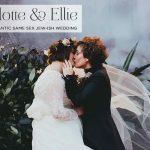 As soon as we met him and he talked us through his style, we knew he would deliver exactly what we wanted – fun pictures that captured the day and didn’t involve us posing for hours meaning we missed our own wedding. Anthony and I are huge cheese addicts and originally, for dessert, we wanted cheese wheels stacked on top of each other to look like a cake. However, as we chose a meat meal, this wasn’t possible, so we decided on churros and alcohol shots to be handed around during the last set of dancing instead (our caterer’s, Adam Zeitlin‘s, fab idea). Adam Zeitlin was recommended to us by Food Story and I cannot speak highly enough of Adam, himself and his company. 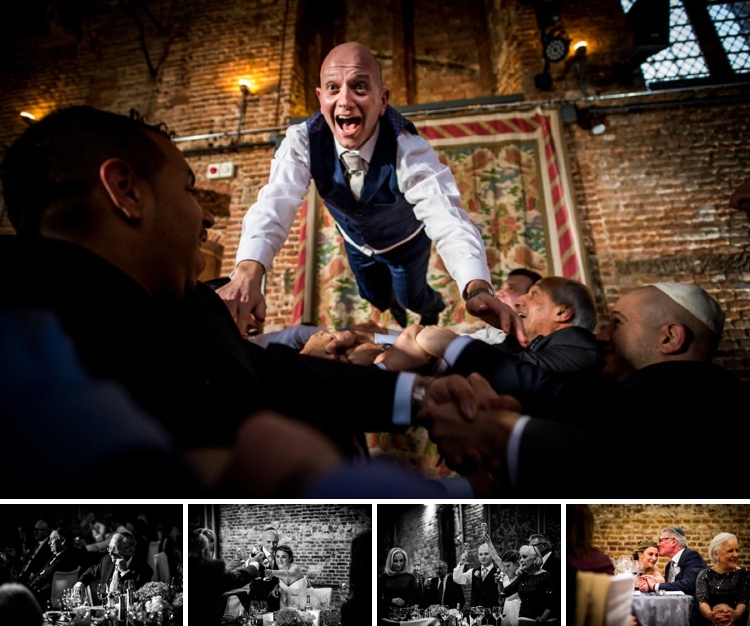 He literally doubled up as our personal wedding planner, adviser, guide etc as well as being an outstanding caterer. I was a chef for many years and food was extremely important to me and Anthony, and were both quite nervous about finding a caterer who could live up to our high expectations. 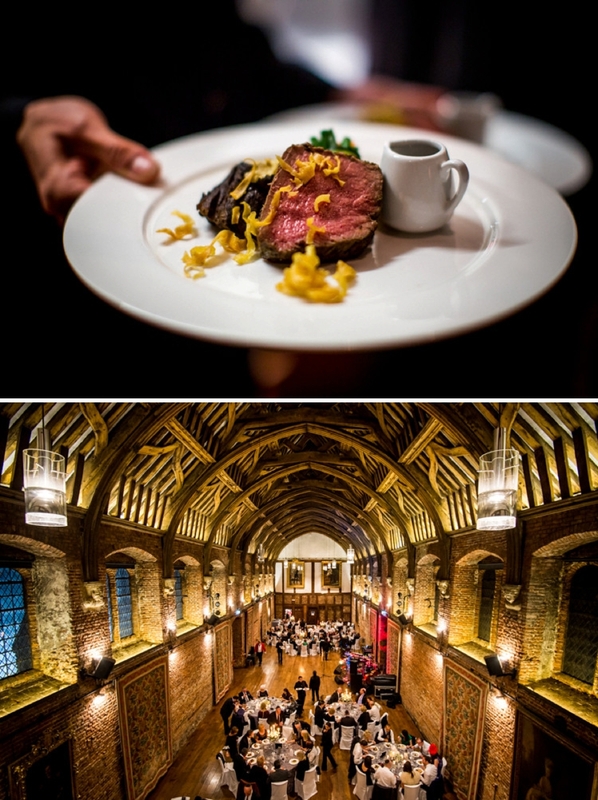 A month on from our wedding, guests are still raving about the quality of food and the service. 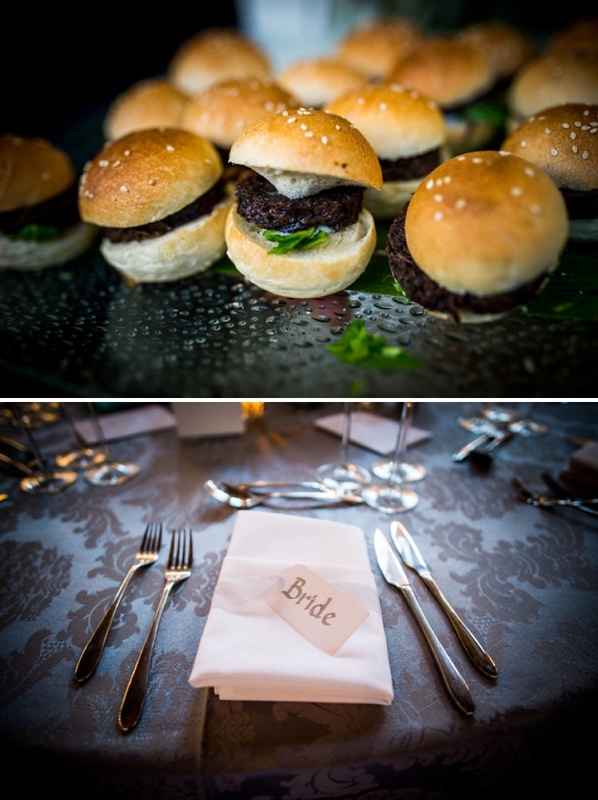 The food made our wedding into the wedding we always wanted! We had a live band, it was really important to us to have live music rather than a DJ. 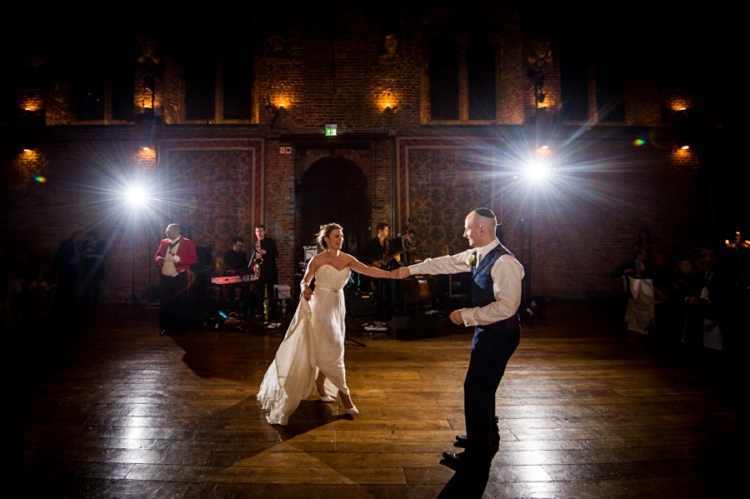 We found it quite hard to find the right band and it got a little stressful, however, Matt McDonough from Limelight Music Agency really helped and advised us. We discussed what we were looking for and he gave us a few suggestions which were all perfect, immediately taking the stress away. We went with his band The Chocolate Martinis and Matt also provided the accordion and violin players for the chuppah and reception who were both brilliant. Jango the Toastmaster was ace! Herding 120 guests into the right places at the right time, especially when food is involved, is no mean feat, but Jango did it with ease. He gave us top-to-toe service, meeting with us beforehand and confirming timings as well as regular check-in’s through the day. He really helped make our day stress-free. We almost didn’t have a toastmaster but changed our mind at the last minute, and for anyone who’s not sure, I definitely recommend booking one — makes life so much easier on the day! 3. You won’t be able to have everything your way so agree your deal breakers early on and don’t worry too much about the other stuff. You only have so much time and energy, so use it wisely. 5. Finally, we organised our wedding in 6 months so don’t worry about having enough time, it really does just come together!